One mud tank 9000x2300x2150mm which is customized design size to meet their storage capacity requirement. 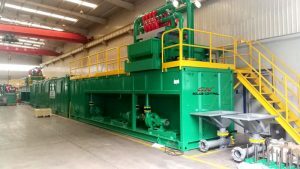 For compact design and better mud cleaning performance, we installed the double deck shale shaker with desilter cones to meet the client’s capacity requirement. A centrifugal pump as feeding pump of the desilter cone, one centrifugal pump as mixing pump for the venturi hopper. The mud agitator and mud gun installed on the mud tank for agitating the drilling mud and prevent the solids from silting. An extra submersible slurry pump is equipped as the feeding pump of the mud recycling system from the mud pit. 3) Mechanical seal centrifugal pump, the impeller and pump casing material is made from hard ductile iron alloy, increased abrasion resistant capability. 4) Double deck shale shaker with desilter cone for 2 phase cleaning and increase the reating capacity. 5) Pretensioned shaker screens with composite material frame for longer working life and better separation performance. 6) Explosion proof electric control system for better rain proof, sun proof and dust proof. 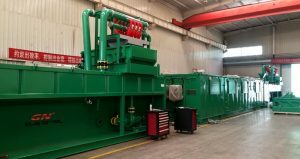 We have standard mud recycling system 200 gpm, 350 gpm, 500 gpm, 1000 gpm and we can make customized mud recycling system as 150 gpm, 400 gpm, 600 gpm, 800 gpm mud recycling & mixing system for our clients.